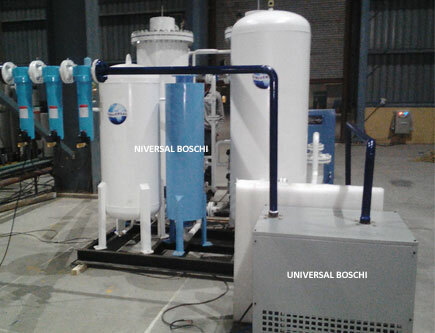 Universal Boschi is acclaimed for fabricating and manufacturing medical oxygen generators for applications in hospitals and other medical purposes. 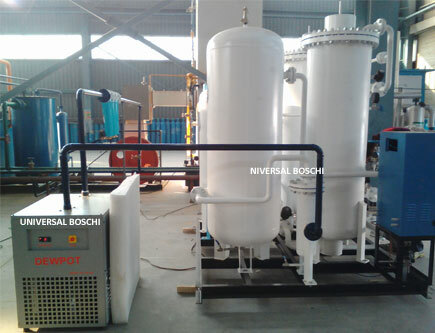 Our oxygen generator for hospitals is preferred because of our reputation for manufacturing high quality oxygen machinery using the modern advanced cryogenic distillation technology. Being the leading medical oxygen generator manufacturer, we are committed to offer our customers the best medical oxygen generator price while maintaining world-class quality and customer service. We have entered into a technical collaboration with ING. L. & A. Boschi of Itlay, which is an acclaimed company for its cutting-edge cryogenic technology. The proprietary Boschi technology is used in the fabricating of the machinery. Boschi technology provides you with the cross row trays, cryogenic materials and high purity heat exchangers due to which we get regular flow and high purity of liquid oxygen. Situated in New Delhi, our medical oxygen generator factory is reputed for fabricating oxygen production plants with precision and high skills. Our factory is also equipped with R & D center, which is engaged in innovating oxygen generators for hospitals as per the market requirements and trends. We invest a great deal of our resources in research to make medical oxygen generator plant which delivers top-class performance and is durable. Our medical oxygen generator cost is competitive in the market. Our company has emerged as the most popular medical oxygen generator manufacturer in India by dint of its investment in quality improvement, designing and customer service. Our medical oxygen generators come in different capacities and sizes ranging from 20m3/hour to 200m3/hour. Compression of atmospheric air : Air is compressed at a very low pressure of 5-7 bar( Kg/cm2) using latest air compressors pre-cooling. It is the 2nd stage of the process and uses a low pressure refrigerant for pre-cooling the warm processed air incoming from air compressor to temperatures around 5 to 10 degrees Celsius before it reaches the purifier. Purification of air by purifier : Air enters purifier made up of twin molecular sieve driers working alternately. The sieves separate carbon dioxide and other impurities from the process air before it reaches the air separation unit. Cooling of air by expander : Air is cooled below sub zero temperatures for ensuring liquefaction and cryogenic refrigeration. A highly efficient expander is used to cool air below -165 to -170 Celsius. Oxygen filling cylinders : Oxygen is filled into oxygen cylinders for distribution or storage as per the requirements of the customers. Hospitals use medical oxygen cylinders for keeping oxygen handy for emergency use.